Dandruff is a common issue for men. If you are one of them, try Dove Men + Care series engineered specifically for men’s hair, giving it a stronger and more resilient style so that it can keep up with men’s active lifestyles, no matter what the day brings. This effective anti-dandruff shampoo is engineered specifically for men’s hair to help prevent the appearance of dandruff. Stronger, more resilient hair for a man’s active lifestyle. Great hair care doesn't stop in the shower! Complete your hair care regimen and get the perfect look with the Dove Men + Care Sculpting Paste for a natural look, Defining Pomade for a sleek and polished finish, or Control Gel for all-day hold. 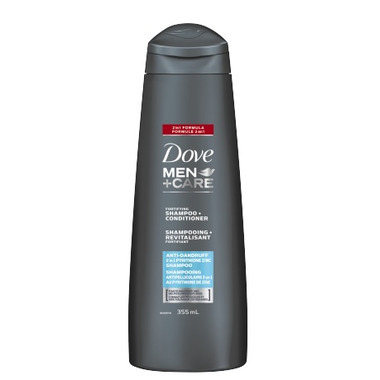 Use it with the entire line of Dove Men + Care products for the perfect grooming regimen, such as Dove Men+Care Clean Comfort Body + Face Wash, Dove Men+Care Thick and Strong Fortifying Shampoo & Conditioner, Dove Men+Care Stain Defense Fresh Dry Spray Antiperspirant, and Dove Men + Care Clinical Protection Stick. No visible flakes with regular use. Against breakage. This is the only shampoo that works for my husband's eczema and dandruff. Smells great too!